The Gothic style of painting started during the 12th century with the architecture, at the height of the Middle Ages. It started in Italy and it spread through the rest of Europe soon after. The Gothic stayed strong for more then 200 years. Europe was trying to put the memory of the dark ages behind it and move on to a more beautiful, radiant era, full of confidence, abundance and prosperity. The in paintings became visible about a century after the first of the Gothic cathedrals arose. The most noticable feature of Gothic paintings was its increased naturalism. This style of painting dominated the styles of the time throughout Europe until the end of the 15th century. Mannerism is a period of European art which emerged the later years of the Italian High Renaissance around 1520. It lasted until about 1580 in Italy, when a more Baroque style began to replace it, but continued into the seventeenth century throughout much of Europe. 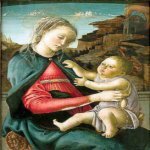 Stylistically, Mannerism encompasses a variety of approaches influenced by, and reacting to, the harmonious ideals and restrained naturalism associated with artists such as Leonardo da Vinci, Raphael, Michelangelo. In the arts, the Baroque was a Western cultural epoch, commencing roughly at the beginning of the 17th century in Rome, Italy. It was exemplified by drama and grandeur in sculpture, painting, literature, dance, and music. The popularity and success of the Baroque style was encouraged by the Roman Catholic Church which had decided at the time of the Council of Trent that the arts should communicate religious themes in direct and emotional involvement. A term Rococo describes a movement in the arts in the early 18th century, in France. Rococo has been born the Baroque era, during the age of Enlightenment. That was a time when new ideas about human existence were introduced and Rococo art is the visual representation of the optimism people felt in response to that. The word rococo is derived rocaille, meaning rock work or shell work, a favorite motif of the time. It stresses purely ornamental, light, casual, irregular design. Academic art is a style of painting and sculpture produced under the influence of European academies or universities. Specifically, academic art is the art and artists influenced by the standards of the French Académie des beaux-arts, which practiced under the movements of Neoclassicism and Romanticism, and the art that followed these two movements in the attempt to synthesize both of their styles, and which is best reflected by the paintings of William-Adolphe Bouguereau, Suzor-Coté, Thomas Couture, and Hans Makart. In this context it is often called academism, academicism, Lart pompier, and eclecticism, and sometimes linked with historicism and syncretism. The Pre-Raphaelite Brotherhood (also known as the Pre-Raphaelites) was a group of English painters, poets, and critics, founded in 1848 by William Holman Hunt, John Everett Millais and Dante Gabriel Rossetti. The three founders were soon joined by William Michael Rossetti, James Collinson, Frederic George Stephens and Thomas Woolner to form a seven-member brotherhood. The groups intention was to reform art by rejecting what they considered to be the mechanistic approach first adopted by the Mannerist artists who succeeded Raphael and Michelangelo. They believed that the Classical poses and elegant compositions of Raphael in particular had been a corrupting influence on the academic teaching of art. Realism in the visual arts is a style that depicts the actuality of what the eyes can see. The term is used in different senses in art history; it may mean the same as illusionism, the representation of subjects with visual mimesis or verisimilitude, or may mean an emphasis on the actuality of subjects, depicting them without idealization, and not omitting their sordid aspects. Works may be realist in either of these senses, or both. Use of the two senses can be confusing, but depending on context the second sense is perhaps more common. Realism as a tendency in 19th century art was related to similar movements in the theatre, literature and opera. All emphasized the depiction of everyday subjects, but by no means always discarding classical, Romantic or sentimental approaches to their treatment. Impressionism was a 19th-century art movement that began as a loose association of Paris-based artists exhibiting their art publicly in the 1860s. Characteristics of Impressionist painting include visible brush strokes, open composition, emphasis on light in its changing qualities (often accentuating the effects of the passage of time), ordinary subject matter, the inclusion of movement as a crucial element of human perception and experience, and unusual visual angles. Post-Impressionism is the term coined by the British artist and art critic Roger Fry in 1910 to describe the development of French art since Manet. Fry used the term when he organized the 1910 exhibition Manet and the Post-Impressionists. Post-Impressionists extended Impressionism while rejecting its limitations: they continued using vivid colours, thick application of paint, distinctive brush strokes, and real-life subject matter, but they were more inclined to emphasize geometric forms, to distort form for expressive effect, and to use unnatural or arbitrary colour. Symbolism originated in France, and was part of a 19th-century movement in which art became infused with mysticism. French Symbolism was both a continuation of the Romantic tradition and a reaction to the realistic approach of impressionism. It served as a catalyst in the outgrowth of the darker sides of Romanticism and toward abstraction. The second half of the 19th century has been called the positivist age and one of the most fascinating periods in our history. It has been an age of faith in the positive consequences of what can be achieved through the close observation of the natural and human realms. The spirit of 19th century England could be personified through Queen Victoria and it\'s known as the Victorian era. It is covering the eclectic period of 64-year reign of Queen Victoria 1837 to 1901. Neoclassicism (sometimes rendered as Neo-Classicism or Neo-classicism) is the name given to quite distinct movements in the decorative and visual arts, literature, theatre, music, and architecture that draw upon Western classical art and culture (usually that of Ancient Greece or Ancient Rome). These movements were dominant during the mid 18th to the end of the 19th century. This article addresses what these neoclassicisms have in common. The Cubist art movement began in Paris around 1907. Led by Pablo Picasso and Georges Braque, the Cubists broke centuries of tradition in their painting by rejecting the single viewpoint. Instead they used an analytical system in which three-dimensional subjects were fragmented and redefined several different points of view simultaneously. The movement was conceived as \'a new way of representing the world, and assimilated outside influences, such as African art, as well as new theories on the nature of reality, such as Einsteins Theory of Relativity. Cubism is often divided into two phases - the Analytic phase (1907-12), and the Synthetic phase (1913 through the 1920s). Expressionism was a modernist movement, originating in Germany at the beginning of the 20th century. Its typical trait is to present the world solely from a subjective perspective, distorting it radically for emotional effect in order to evoke moods or ideas. Expressionist artists sought to express meaning or emotional experience rather than physical reality. Expressionism was developed as an avant-garde style before the First World War. It remained popular during the Weimar Republic particularly in Berlin. The term is sometimes suggestive of emotional angst. In a general sense, painters such as Matthias Grünewald and El Greco are sometimes termed expressionist, though in practice the term is applied mainly to 20th-century works. The Expressionist emphasis on individual perspective has been characterized as a reaction to positivism and other artistic styles such as naturalism and impressionism.